The ‘intrinsically safe’ 28II Ex is Fluke’s hardiest and safest multimeter. A serious upgrade to the already solid 28II (and reclassified from the 87V Ex), it is built to be used in explosive environments, such as the oil & gas or chemical industries, and is spark-proof, watertight and built to withstand 3m drops. Along with the extra safety and build quality, in this Fluke 28II Ex review we also detail its functions and specs. This is a highly sharp and reliable device, with a basic DC voltage accuracy of 0.05% and useful input ranges, to include capacitance, duty cycle, frequency, and temperature. Bearing in mind it is very pricey, but is as strong and safe as you can get. Hence the name, the ‘Ex‘ is good for working in ‘Ex-rated’ Zone 1 and 2 areas – more on hazardous areas classification here. This would include mines, the pharmaceutical industry, and oil rigs and refineries, for example. It has a temperature class to T4 and is IP67 dust-proof and waterproof, as well as drop-proof (to 3m). Its measurement ranges are all pretty impressive, with voltage to 1000V, current to 10A, and resistance to 50MΩ. The temperature range is also wide and, along with milliamp and micro-amps ranges, are capacitance, frequency and duty cycle ranges, as well as continuity and diode tests. As this is a True RMS meter, you can also measure distorted AC signals correctly, such as those that are produced by inverter drives. A low-pass filter improves accuracy further and you can perform leakage tests with the conductance range. Duty cycle measures percentage of on-time. This meter is an auto-ranger by default, so it selects the correct range automatically when you turn it on and go to measure. Switching over to manual mode lets you select the appropriate operating range for those that prefer to test the old fashioned way. Both are fast and accurate. Min/Max-Average: records low and high values and produces an average. This works particularly well with changing signals, such as voltage and temperature. Peak capture: record transients up to a speed of 250µs. AutoHOLD: freezes the display automatically, good for when busy testing. The Ex also comes with an input alert in case you get the probe leads mixed up. Both the display and keypad buttons are legible in low light conditions. Best Suited To? : Journeymen involved in hazardous industries will benefit most. The 28II Ex suits gaseous or chemical zones, where a standard or cheapo multimeter would not be safe. This is a full range multimeter, suiting both electricians and electronics technicians. The 28II Ex is so well built and protected it could be considered over-engineered. This extra ruggedness includes a watertight case that consists of a deep tongue & groove arrangement. Protecting the exterior is a thick red rubber boot – a departure from Fluke’s normally yellow holsters, likely to denote the Ex’s extra level of protection. The case is held tight with several screws, including torx screws on the battery/fuse cover. Inside again through a separate cover is access to the HRC fuses. Battery holders are extra secure and the circuit board is furnished with blast shields and isolation slots. The 4 ½ digit display is dual resolution, with a standard 6,000-count and a Hi Res 20,000-count resolution. You can discern readings up to 19.999V in the high-resolution mode before it drops to 20.00V. NOTE: not all ranges use the Hi Res mode. There’s also a bar graph on the bottom of the display and it has a two-stage backlight that is ideal in dusty, dark environments. The buttons also light up in the dark. Battery life is around 400 hours. This multimeter can handle hazardous zones without losing out on performance and while keeping the environment safe. It is drop-tested to 10ft (about 3m) and IEC safety rated to Category III (1000V), covering building installations, and Category IV (600V), for source installations. Considerable attention has been paid to the circuit board on the Fluke 28II Ex to prevent potential sparks. Components, soldering and traces are of high quality, and there are isolation slots around inputs and high current traces, which are also sealed with resin. A power resistor, MOVs, bridge rectifier and a PTC come as standard and there are separate daughter boards for further protection. Fuses (11A and 440mA) are of the HRC type, with the milliamp input being potted in hard resin. Fuses are rated to 1000V to earth and the input protection can withstand high energy spikes. Further protection is provided by the optical input alert system, which sets off the beeper and flashes a warning when the leads are plugged into the wrong jacks for a given dial position. 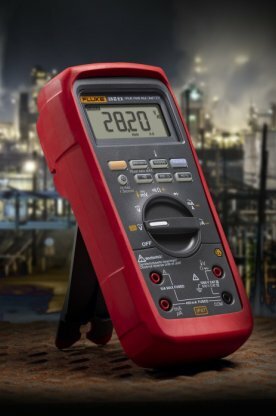 With the same usability as the standard 28II and the flagship 87V, the Fluke 28II Ex review reveals a quality multimeter for those working in hazardous industries. There is none tougher – it is watertight and boasts the accuracy of a topflight meter. An optional magnetic hanger makes things easier as this is a heavy device.